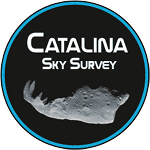 The Catalina Sky Survey (CSS) is a NASA funded project supported by the Near Earth Object Observation Program (NEOO) under the Planetary Defense Coordination Office (PDCO). We are based at the University of Arizona’s Lunar and Planetary Lab in Tucson, Arizona. Our mission at CSS is fully dedicated to discover and track near-Earth objects (NEOs) in an effort to meet the congressional mandate to catalogue at least 90 percent of the estimated population of NEOs larger than 140 meters, some of which classify as potentially hazardous asteroids (PHAs) which pose an impact threat to Earth. Longstanding success of the project is attributable to our comprehensive sky coverage, continued development and application of innovative software and our NEO detection pipeline, and the inclusion of near real-time human attention to the NEO discovery and follow-up process. On April 18, 2019 newly discovered asteroid ‘2019 GC6’ will graze by the Earth passing between the Earth and moon. The Catalina Sky Survey posted 1056 new near-Earth objects for 2018, the first survey to discover more than 1000 in a calendar year. The record-setting 2018 batch also pushed CSS’s historical total to over 9000 new NEOs. On October 19, 2018 Earth was grazed by a small asteroid designated as ‘2018 UA’. The space rock was discovered by the NASA-funded and University of Arizona based Catalina Sky Survey only 10 hours before its closest approach. For only the third time in history a near-Earth asteroid was discovered before impacting Earth. Remarkably, all three objects have been discovered by one observer at the Catalina Sky Survey.